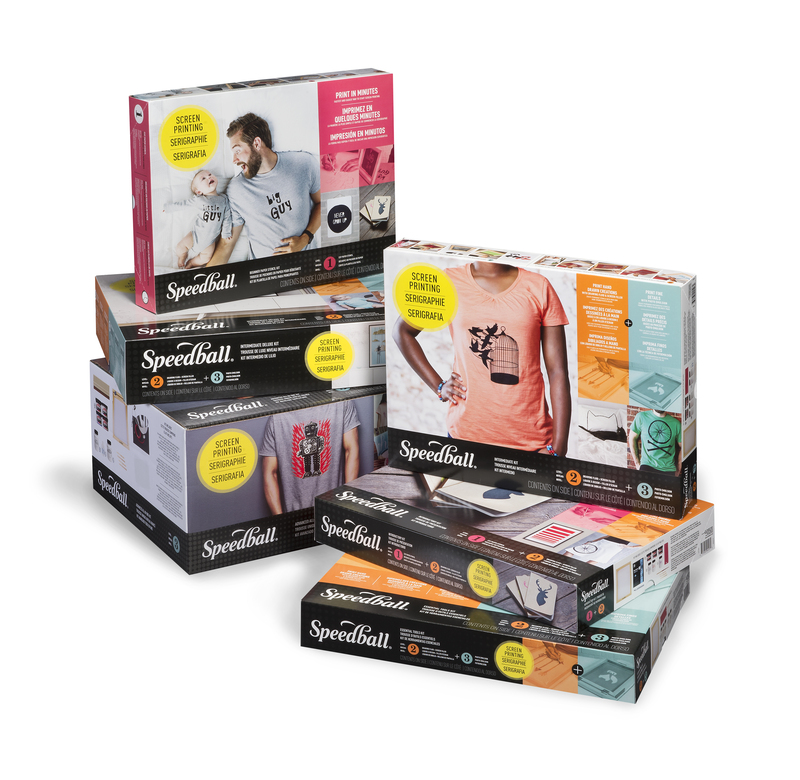 Speedball has developed a range of screen printing kits featuring all the essentials specific to your screen printing project. 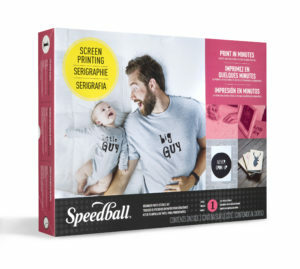 Whether you’re new to screen printing and experimenting with our Beginner Paper Stencil Kit, or a printing pro ready to make your next epic design with our Advanced All-in-One Kit, Speedball’s Screen Printing Kits contain just what you need. Select any of the listings below to learn more about each of these expertly-created kits, designed with you in mind. 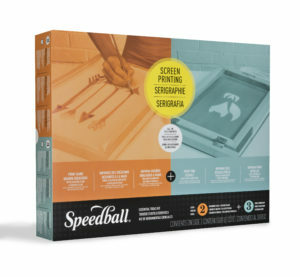 This kit provides the best introduction to screen printing by way of the paper stencil method of screen printing and includes (1) each of the following: 10”x14” Speedball Wooden Screen Frame; Red Baron™ Squeegee; 4oz. jar of Speedball Fabric Screen Printing Ink (Black); Bienfang® Graphics 360™ Paper Pad; Craft Stick; Utility Knife; Speedball Screen Printing Instruction Guide. For artists ready to tackle both the Drawing Fluid/Screen Filler and the Photo Emulsion methods of screen printing to print on paper, this kit is an excellent find! 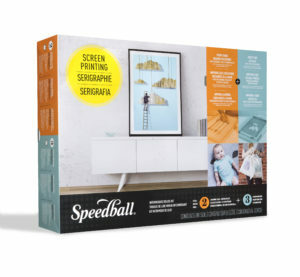 The Speedball Intermediate Kit includes: (1) 10”x14” Speedball Wooden Screen Frame; (1) Red Baron™ Squeegee; (2) 4oz. jars of Speedball Fabric Screen Printing Ink (one each Black, Red); (1) 4oz. bottle of Drawing Fluid; (1) 4oz. bottle of Screen Filler; (1) 3.3oz. bottle of Speedball Diazo Photo Emulsion; (1) bottle of Speedball Sensitizer; (1) 4oz. bottle of Speedball Photo Emulsion Remover; (1) 4oz. bottle of Speedball Speed Clean™; (1) Round Brush; (2) Craft Sticks; (1) Speedball Screen Printing Instruction Guide. Provides all that’s needed to print on either fabric or paper using the Drawing Fluid/Screen Filler and the Photo Emulsion methods of screen printing. This kit contains: (1) 10”x14” Speedball Wooden Screen Frame and Base; (1) 8”x10” Speedball Wooden Screen Frame; (1) Speedball Craft Squeegee (Textile); (1) Speedball Craft Squeegee (Graphic); (2) 4oz. jars of Speedball Fabric Screen Printing Ink (one each Black, Red); (4) 4oz. jars of Speedball Acrylic Screen Printing Ink (one each Black, Process Cyan, Process Magenta, Process Yellow); (1) 4oz. bottle of Drawing Fluid; (1) 4oz. bottle of Screen Filler; (1) 3.3oz. bottle of Speedball Diazo Photo Emulsion; (1) bottle of Speedball Sensitizer; (1) 4oz. bottle of Speedball Photo Emulsion Remover; (1) 4oz. bottle of Speedball Speed Clean™; (2) Speedball Transparencies; (1) Round Brush; (6) Craft Sticks; (1) sheet of black paper; (1) Speedball Screen Printing Instruction Guide. Ready to take on the Photo Emulsion method for your next creation? Then this kit is perfect for you! 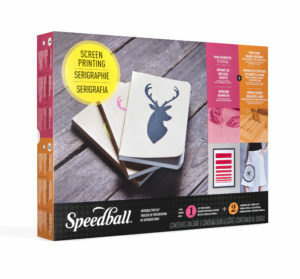 Not only does the Speedball All-in-One Kit include all of the tools and inks featured in complementary kits in the line, but it also contains the light source needed to make the process of exposing your screen a breeze! This kit includes: (1) 10”x14” Speedball Wooden Screen Frame and Base; ; (1) Speedball Craft Squeegee (Textile); (4) 4oz. jars of Speedball Fabric Screen Printing Ink (one each Black, Red, White, Blue); (1) 3.3oz. bottle of Speedball Diazo Photo Emulsion; (1) bottle of Speedball Sensitizer; (1) 4oz. bottle of Speedball Photo Emulsion Remover; (2) Speedball Transparencies; (1) Lamp; (1) Photoflood Bulb; (1) Lamp Clamp; (4) Craft Sticks; (1) sheet of black paper; (1) Speedball Screen Printing Instruction Guide. 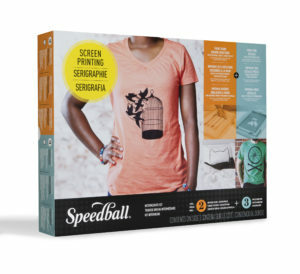 Want to learn more about how to get the best results from you Speedball Screen Printing Kit? Select from the links below to see view step-by-step instructional videos on a range of screen printing methods.